I like to show crayfish crochet samples. is The College at Endover. for falling head over teakettle. and my days as an astronaut. Mostly I just gasped a lot. the tubes full of food, pre-chewed. I can’t find my car quiche. so I’m careful to a fault. is stored in a pole vault. Not much of a honcho. © 2010 Calef Brown. All rights reserved. Calef Brown writes poems that make me giggle and chortle and revel in their wordplay. And, as if that's not enough, he's an illustrator who consistently makes me giggle and chortle or go "oooooh!!!!!' in a very happy way. Combine those talents, and you get fantabulous books like Polkabats and Octopus Slacks (in which this illustration appears) and Tippintown: A Guided Tour. Here's a challenge for you - say "octopus slacks" and think about an octopus wearing slacks without smiling. I don't think it can be done. Besides children's books, Calef Brown also does editorial illustration (to my knowledge making him the first poet on this year's 30/30 list to be in Rolling Stone) and much, much more. His website is chock full o' eye candy, and I highly recommend reading more about him at the wonderful 7 Impossible Things Before Breakfast. And his books... yes... did I mention how fun they are or that later this year, we'll get a new Halloween themed one? True! That makes me happy... as does having Calef Brown here as part of 30 Poets/30 Days. Yesterday gave us Anaconda by Laura Purdie Salas. Tomorrow... Move Out! by Carole Boston Weatherford. For more on 30 Poets/30 Days and ways to follow along, please click here. This is a massive tongue-twister! I've been trying to read all the Poetry Month selections aloud, but this one half killed me! Oh, I love Calef Brown! Thanks for sharing! 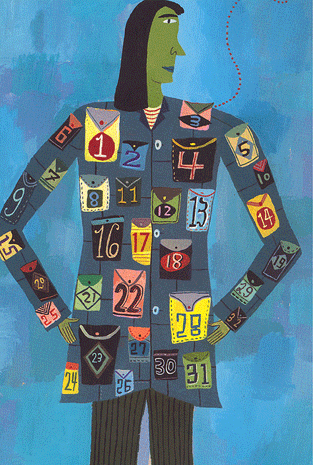 Loving your 30 days series once again and so glad you've included Calef in your round up. He's such a clever genius-- with both words AND pictures! Thanks very much for the very kind comments, and thanks to Greg for inviting me to be part of this fantastic endeavor. Wow...this drips with clever. What a treat to read! Thanks! Holy Cow! The tongue twisters wouldn't stop! How DID he get them all into one poem?!?! Clever, absurd, and absolutely fun! Thanks for sharing this!